Inspiring Ideas with artist Jeanne Winters: Fresh Spring Idea! Everyone I talk to has spring on the mind ... a few in the north are praying it comes SOON, while elsewhere others are already enjoying it's fragrant blooms. As long as we're thinking it, let's do something fun for it! This little idea works all year long, but is especially fun in the spring. 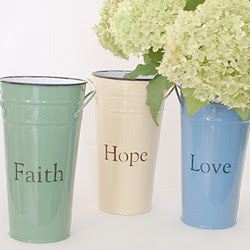 Stencil "Faith," "Hope" and "Love" on a bucket trio! You can find these buckets anywhere - and in any shape, size and color - especially in the spring. Enameled ones like this example come in gorgeous colors so look around to find ones perfect for your place or for the person you want to gift these to. Craft stores have the plain silver ones - which you can spray paint if you prefer, but not necessary. Mine [shown] are towards the large end of the spectrum. Directions: Simply stencil using a sheet of alphabet stencils. Be sure to buy paint that works on metal. This would be a nice Mother's Day gift, too! Enjoy! I love spring and I like this idea. When I saw the hydrangeas, I was hooked. It's my favorite flower, and I used so many of them in my wedding, in 3 different colors. Absolutely love them! Thanks for this idea.